Floor Services | DMS Building Maintenance, Inc.
We know how to take care of your floors! We hire and train experts at all kinds of floor care. We know exactly how to treat each floor type. Give us a call or email us so we can talk about how we can take care of your floors!! You’ll be glad you did. First we love concrete because yes It is a tedious job but the outcome is amazing all the time! 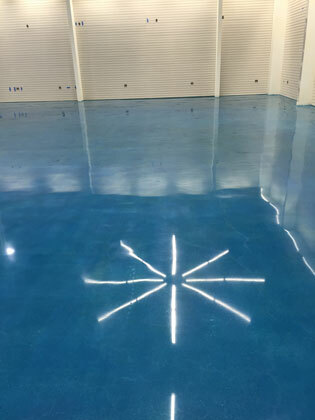 You can turn boring concrete into a magnificent work of art and even put the logo of your company down, stain it, and seal it so it will never be damaged and it always looks great! Vinyl Composite Flooring, otherwise known as VCT, is easy to maintain as long as it is properly serviced regularly on a schedule. Most locations with normal day-to-day regular work traffic flow will only need to have us scheduled out to Strip and Wax, or scrub and wax (depending on the severity) the flooring quarterly or bi-Yearly depending on how frequent you sweep, mop, and maintain your flooring. If neglected, those regular times might be affected and could possibly cause more frequent floor schedule servicing. 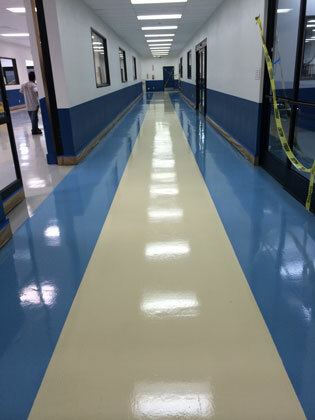 Our typical schedule is a quarterly Stripping and Waxing of all VCT flooring and doing a monthly scrubbing to maintain the freshly applied wax. We WILL NOT put minimal amounts of sealer (as most companies do) with inexpensive store-bought over the counter sealers and cleaners. We put a MINIMUM of 3 coats of sealers, and sometimes more if the floor has never been waxed or requires it. We DO NOT shorten any type of work at DMS just to cut corners and make more profit. We are NOT in the business for that. Our goal is to complete the job the CORRECT way the FIRST time despite any cost losses or changes. We also use one of the HIGHEST grade sealers and Industrial cleaners. It does in fact cost slightly more on our end, but that’s okay. We would like the job to be completed correctly and efficiently the first time. Don’t worry. If you are thinking to yourself, “Shoot! I just had another company do my floors and they look terrible or not that good,” We got you covered! We also do repair and restoration based services on bad VCT jobs. We will remove all old or cheap wax (usually hazy, not shiny, flakes off or has a yellow tint to it) and reapply with the good stuff! We have only the highest grade of equipment for your stone floors such as high speed grinders and diamond appliances. We have a great deal of experience in stone care and are even USA Certified to work with all types of stones. We have knowledge and experience of this work for over 25 years. We have the correct high-speed floor burnishers and polishers to burnish and polish your floors correctly the first time. With our trained techs. And staff here at DMS and our industrial Ride-on and advanced walk behind technology systems, we have the necessary high-grade tools and equipment here to get the job done. Scrubbing and waxing is essential to maintaining your nice floors. After we have stripped your floors previously (or another company has), it is always best to keep a consistency to scrub the floors on a schedule. In the long run, you will actually save money versus waiting until it gets bad for a more heavy cleaning procedure. Polishing your floors will definitely bring the shine out of your nicely waxed and coated floors and displayed the way they should be. After all, we detail and polish our cars, so why not give the same thought to your flooring displaying your business and to your customers. Think of a car. When you do not wax your car, what happens over time? The clear coat will start to flake off, your paint will dull, and eventually you will need a new paint job or to just sell the car. That is definitely NOT the way or mindset to have. This example is great because it is very similar to flooring. If you DO NOT wax your floors and take care of them, what will happen over time? Exactly, the same process. The wax will start to flake off (If any is applied previously), your floor color and grade will dull, and your floors will actually have permanent scuff marks until the point of restoring your tiled floors or completely replacing them. Why not MAINTAIN them by getting a quarterly Strip and Seal (Similar to Waxing your car) so your floors will stay in tip top shape and the only maintenance to do from there is to sweep and mop them regularly (same as a car wash). Plus, we will do that for you when you sign up for our janitorial service anyway so we got you covered on all ends so you can get back to your clients and leave the floor and janitorial headaches for us to present to you. It is the little things that make a HUGE difference!